Chesapeake Bay Maritime Museum Shipwright Joe Connor reports final preparations are underway on the restoration of Edna E. Lockwood, with the 1889 bugeye and National Historic Landmark set to relaunch at CBMM’s OysterFest on Saturday, Oct. 27. This spring, Edna’s hull was finished and her whiskey plank installed. Since then, attention has turned to the deck, where the main and cargo cabins have been rebuilt. Most of the deck planking was in good shape, so shipwrights only needed to replace roughly 12 feet of her king plank and less than 10 percent of her deck planks. The deck has been caulked (with oakum on cotton), and coats of paint are starting to build up. The hull has also been faired, and the first coats of paint applied. The outer stems on both bow and stern have been fabricated and installed. 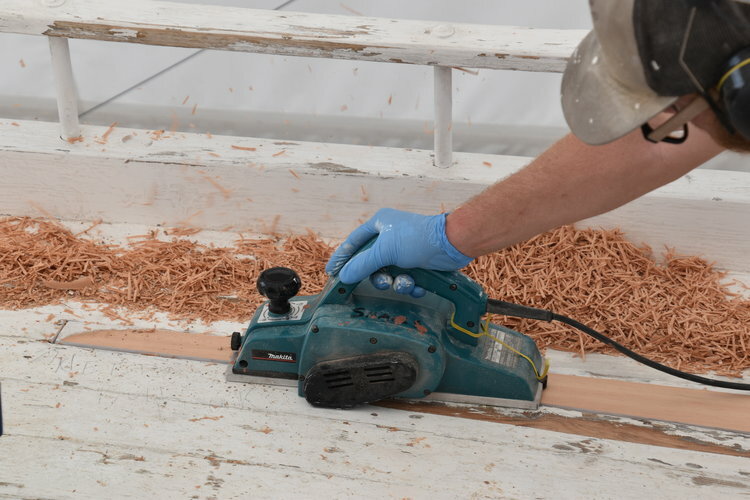 In the coming months, shipwrights and apprentices will be rebuilding the gammon knee (chicken beak), caulking planks, and installing the rudder, steering gear, stepping masts, and rigging. Above Edna’s log section sits 2-inch yellow pine planking fastened to 5-inch double-sawn white oak frames. The existing fasteners were steel square boat nails, which are very effective but are not conducive to future restoration work, as they are permanently installed. For this reason, it is common CBMM practice to fasten with Frearson head bronze screws for ease of maintenance. Since 2016, the team has been restoring CBMM’s Queen of the Fleet by replacing her nine-log hull, in adherence to the Secretary of the Interior’s Standards for Historic Vessel Preservation. Shipwright apprentices working on the project are generously supported by the Seip Family Foundation, and RPM Foundation.